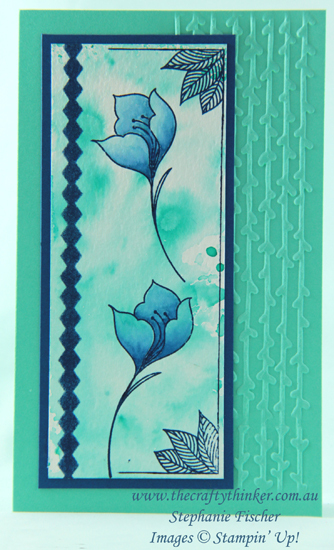 This card is entered into the Crazy Crafters Team Highlights. Click here to see all the projects and vote for your favourites. Like many "crafty" people, at various times I've tried quite an array of arts and crafts and sometimes those different craft worlds seem to collide. For instance, the gorgeous images in the Serene Garden stamp set very much remind me of my ceramics and porcelain painting days! So, I pulled out a background I'd watercoloured a while ago and my new Blueberry Bushel ink to create a little bit of an homage to traditional blue and white china. I stamped and then watercoloured with the same ink colour. TIP: Since it can be a little difficult to obtain a clear stamped image on watercolour paper, I used my Stamparatus so that I could keep stamping in the same place until I was satisfied with the stamped image. I used a ruler and a marker to extend the lines at the edges of the image. I also used the marker to join the flower to the stem. I'm sure I'm odd but the "floating flower" bothered me in this project. Just love the combination of Blueberry Bushel and Coastal Cabana! I adhered the stamped layer to a piece of Blueberry Bushel cardstock. Before adhering my decorative layer to the card, I used one of the Petal Pair embossing folders on the right side of the card base. Did you notice the diamond pattern down the left side? That's me maximising my use of the Delightfully Detailed Laser Cut paper! I'd already used the strip of laser cut diamonds in this card and decided to use the leftover "blank" as a stencil. TIP: I taped the strip down at each end and used a piece of scrap paper to protect my card underneath and the rest of the "mask" from the ink. 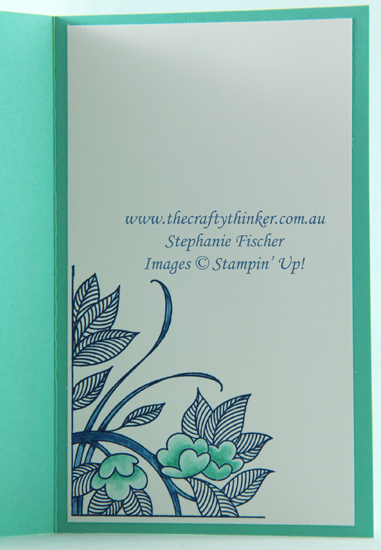 Maximising the use of the Delightfully Detailed Laser Cut paper - it works as a stencil too! Inside the card, I stamped another image from the stamp set and watercoloured with Blueberry Bushel, Coastal Cabana and Bermuda Bay inks.